numbers specify Navy Stock Account (NSA) materiel, and even numbers specify either Appropriation Purchases Account (APA) materiel or nonstores account materiel. The second character of the symbol indicates the cognizant inventory manager and is entered in CC 56. 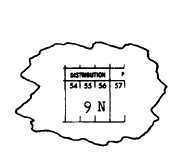 For example, if the cognizance symbol is 9N, it appears in the distribution field as illustrated here. When the cognizance symbol is not known and the fund code cited does not signify a charge to an allotment under NSF, leave CCs 55-56 blank. If the fund code cited signifies a charge to an allotment under NSF, enter a cognizance symbol compatible with the fund code. 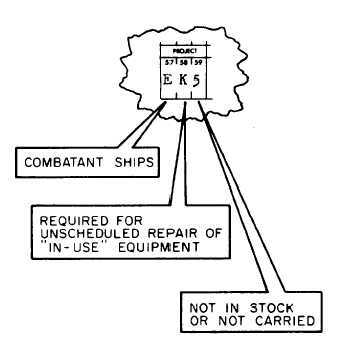 For example, a USS John Paul Jones (DDG-32) requisition citing fund code NR, for a machinery repair part that cannot be identified to NSN, does not require you to enter a cognizance symbol in the distribution field. 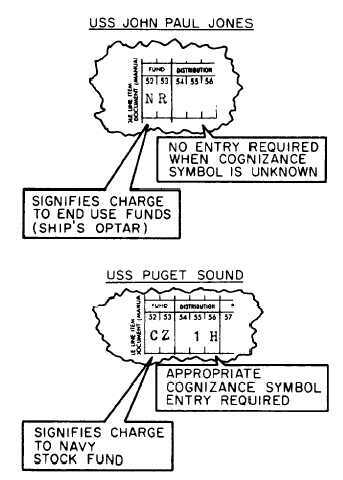 However, a USS Puget Sound (AD-38) requisition citing fund code CZ for the same item would have the cognizance symbol entry 1H in CCs 55-56. Entries would appear as shown in figure 12-5. CCs 57-59, PROJECTThe project code is a mandatory three-character entry (fig. 12-6) used to identify the purpose of the requirement. These codes are recognized throughout the distribution system and assist the supplier in determining the appropriate method of handling and marking of shipments. The third position of the project code may be used to provide the sixth digit of a storage location if needed. See appendix 6 of NAVSUP P-485 for a complete listing of codes. CCs 60-61, PRIORITYThis is a numeric code assigned by the requisitioner that indicates the mission of the requisitioner and the urgency of need for the materiel. PD is assigned according to the procedures explained earlier in this chapter. Figure 12-5.-Data blocks illustrating cognizance symbols for fund codes NR and CZ. Figure 12-6.-Data block with project code entry.